One of the most important components of a Volvo's brakes is the brake calipers. 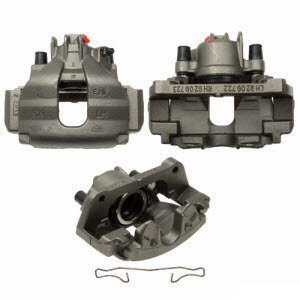 In order to understand why Volvo brake calipers are such an important component of any car's brake system, it is a good idea to know how they work. Here are some of the things that you should know about Volvo brake calipers, and the role that they play in the way your Volvo functions. The purpose of brake calipers is to slow down the wheels of the car. They do this by creating friction with the brakerotors. The brake caliper has a pair of metal plates which clamps over the rotor; these are what we know as brake pads.Brake pads work by causing friction with the rotors, and ultimately slowing the car's wheels down. As with the other components over your cars braking system, there is going to come a time when the brake calipers are going to need to be changed. Cars come with calipers built into the design of the brake system. The kind of calipers used will be appropriate for the size and design of the vehicle, as will the rest of the factory specification braking system. Remembering about replacing your calipers is very important, as you will not want to have faulty or ineffective brakecalipers. If the boots on the caliper rot and leak fluid, you are going to need to have them replaced. The most common sign of this problem is when you say fluid that has leaked beneath the car. However, you will not know just by pressing on the brakes the way that you would if your brake pads or brake rotors were damaged and needed to be replaced. No matter what type of vehicle it is that you are driving, you are going to need to purchase and maintain brake calipers. Cars, SUVs, and trucks are all vehicles which require calipers. While it is much easier for a motorcycle to slow down than other types of vehicles due to its small size and weight, they also will require the use of brake calipers. This means that regardless of what type of transportation you use to drive yourself from place to place, you are going to need to take into consideration this element of your brake system. Speeding is a common problem, although the majority of drivers are aware that it can lead to accidents. In the event of something moving onto the road out in front of you, such as an animal or a pedestrian, you will be more likely to hit it if the car that you are driving cannot slow down right away. Always take into account that braking relies on your reaction times as well as good braking systems. There is also a good possibility that you will get into a car accident during bad weather conditions if you drive too fast, and if your brakes are ineffective. All of these are just more reasons to think about replacing brake calipers when necessary. Driving safely and responsibly in a well maintained car is something that should make any road user proud.